This is a terribly exciting website, if you haven't worked that out already. It probably renders quite well in lynx. I used to have a Christmas Island (.cx) domain, but they're so expensive now, I'm not going to bother with it anymore, so it's defunct, and the content is archived here, if you can find it. I would have just dumped it, but over 2 million people viewed the site (In about 7 years). I also had a .net.au, but they're too expensive, for what they are, so I've not bothered to renew it either. I instead registered this .net. and now I have to work out what I want to use it for. It's mainly just for my email at the moment, but at some point I'll start putting some content up here. I moved my blog from tcpip.net.au to here, but then I decided to take it down. I've started a new blog, "techblog", which just details technical things I do, you can read it here. I bought a camera a while ago, and I've put some photos up. I've got a few galleries, which you can view here, but that was using "yappa-ng", and it got hacked. I also can't get it to work properly on my new webhost, because I can't use the system wide imagemagick binaries. Anyway, I've started uploading my photos to flickr, you can view them here, and my flickr profile page here. Oh, and there's a bunch of old junk you can browse through in here. All old photos and stuff, some quite funny. (It must be pretty funny, a lot of it has ended up posted on myspace, and other sites). My DVD collection is listed here, in case you're interested in what movies I like. I use last.fm, my user page is here, if you're interested in what music I listen to. I've uploaded some videos I've taken at concerts etc, they're on YouTube, here. I started world travelling in 2006. There's a page here, if you want to know where I've been. (In case you're interested, I'm playing an Alverez 5 string bass. 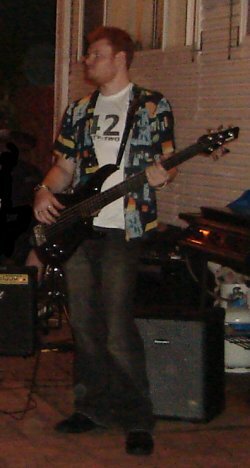 I now own and play a Geddy Lee Signature Fender Jazz Bass that I bought in Oceanside, California). I ride a 1999 Yamaha V-Star Classic, there's a pic here. I'm on MySpace, I don't know why, my page is here, I'm also on facebook, my page is here. And because I'm a masochist.. Hot or Not?. My ICQ profile page is here. I've submitted content to wikipedia, my user page is here. my cell phone is starving hasn't eaten for years no messages to feed it no sms recieved from her. i could go out on a saturday night to the local bar and be that guy, alone in the corner staring at some pretty brunette and then walking home, tired and drunk and... that phone never ever does ring anymore.